Of all the many collaborations that Santana engaged in for 1999's Supernatural album, the partnership with alternative rocker Dave Matthews was one of the most interesting -- at least personally. 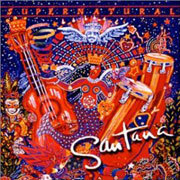 After all, as an acoustic guitarist/vocalist/bandleader, Matthews is himself an unconventional artist, as is Santana. Together, the two crafted the hip-hop tinged ballad "Love of My Life": an uneven yet sometimes brilliant song that had Carlos playing out of the box both style-wise and tonally. Love of My Life starts with a syncopated, modern drum and bass groove, over which a rapper introduces Carlos and the band. The verse and chorus consist of a call and answer with Matthews singing and Carlos responding on guitar. During the verse, Santana crafts blues riffs that complement Matthews' melody, while in the chorus he pretty much mirrors the melody exactly. The song is in the key of Gm, and stays pretty firmly ensconced, although it does shift between Natural minor (Aeolian mode) and Harmonic minor (when it goes to the D7). There's a break after the second chorus where Santana echoes his own guitar riffs -- albeit with different tones. Though Dave Matthews certainly has a unique style, the song is uneventful. That is, until the end. There, the song picks up the tempo and moves into a rollicking salsa-inspired Latin groove, complete with a lively montuno pattern on the piano. Over this end groove, Santana solos with his trademark style. He manages to use a basic Gm pentatonic scale, while throwing in a few alternative scalar tones, and, like his lengthy solos in "Guajira" (from the Sacred Fire: Live in South America album), fits it seamlessly into the complex salsa progression underneath. This is where Carlos shines, and it turns the second half of the song into an exciting, uptempo dance number. For the outro alone, Love of My Life is worth listening to, and, in fact, became one of the secondary singles issued from Supernatural (overshadowed by the blockbuster success of "Smooth" and "Maria Maria").